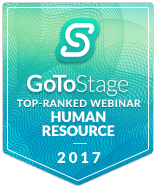 "GoToWebinar (GoToStage) rated this one of the top 100 Human Resources webinars of 2017!" This is a recording of a live webinar held on July 22, 2017. The benefits of mindfulness meditation are well researched. Wendy Quan, Founder of The Calm Monkey, will introduce mindfulness and meditation in a non-religious fashion, and teach you some easy skills that you can start using right away at work and at home. Use these techniques to get centered, de-stress and calm yourself at any time. Mindfulness is a ‘way of being’ that anyone can learn and creates a more positive experience of life.